ICACC member, Bass Coast Shire, has announced these community events to celebrate NAIDOC Week 2016. Inverloch Library NAIDOC Week story time, Wednesday 6 July, starts 10:30 AM. Wonthaggi Library NAIDOC Week story time, Thursday 7 July, starts 11:00 AM. 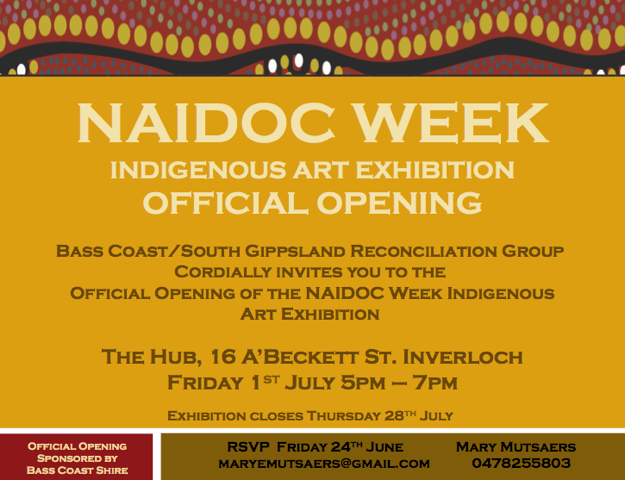 To celebrate NAIDOC Week 2016 the Bass Coast – South Gippsland Reconciliation Group is holding an Indigenous art exhibition in Inverloch. The official opening of the exhibition is on Friday 1 July, 2016 from 5:00 – 7:00 PM, while the exhibition itself runs until Thursday 28 July 2016. The official opening is sponsored by ICACC member, Bass Coast Shire Council. Come along to a fun-filled community and Council event to celebrate NAIDOC Week in the City of Greater Dandenong. Activities will include an official opening by Mayor, Heang Tak, alongside a local community Elder and also include three young Aboriginal people who’ll be acting as MCs. Performances by an Indigenous Hip Hop group and Jindi Worabak Dancers, broadcasting live on the big screen, as well as crowd participation in the workshops and other fun activities.